So then it makes sense that, for many people, you measure your progress by stepping on a scale. If the number goes in the direction you want, that's success. If it doesn't, that's failure. But scales lie my friends. And yes, sometimes I have to remind myself of that fact as well. Are you sure your scale is 100% accurate? Don't we almost all believe the doctor's scales are somehow wrong? And what about those fancy scales that measure BMI, body fat percent, even water weight? Where do those calculations come from? How accurate are they? I actually came across one article that suggested that most scales don't accurately show a percent fat change for weight loss that is approximately 5 pounds or less. What I find a bit funny is that even if we aren't math whizzes somehow we still like numbers. Numbers seem more tangible. More definite, scientific perhaps. But why do we trust numbers more than we trust how we actually look and feel? Especially if those numbers aren't truly showing the whole picture? So how are you to measure progress when you're wanting to track weight loss? First off, my suggestion is: don't focus on weight. Yes, you do need to know weight for certain calculations like body fat and caloric intake needs. But it's important to not get hung up on that number and determine your success or failure based solely on that number. I suggest to focus on losing body fat and increasing lean muscle mass. This is done with a plan that includes resistance and cardio training and proper nutrition. If a client tells me they "only" lost x pounds, but I check their body fat percentage and that's gone down and their lean muscle mass has increased, I call that a success, progress. The truth of the matter is, you can weigh more but have less fat. 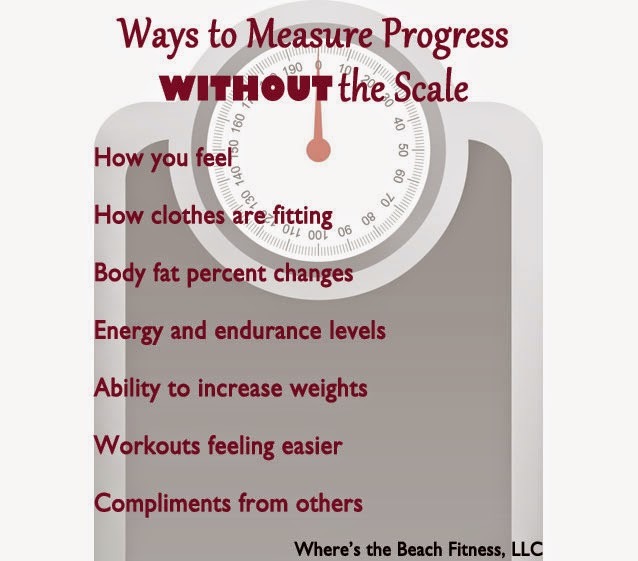 Again, the number on the scale doesn't define the big picture. If your body fat percent is down, you're looking fitter, your clothes are fitting better but you weigh the same, how is that not progress? Just because someone weights x pounds doesn't mean they're in shape. Someone can weight 125 but have excess body fat. That's not healthy, that's not progress. That's just a number on the scale, again, not telling the entire story. I think progress for fitness and health can be measured in many ways that do not at all include the number on a scale (this is certainly not a full list). Never trust a scale! We'll not never but I agree, it's not the tell all for weight loss. My clothes are always a good indicator of how my body is doing. Waistband a little tight? Most likely too much indulging.